A couple of years ago I did some reviews of block island organics products and loved them. I actually asked them if they would contribute to this guide because they make great face products. And happily they agreed. block island organics natural face moisturizer SPF30 is a wonderful facial sunscreen for the winter. It is a heavier feel facial moisturizer and has an all natural SPF30 coming ffrom Zinc Oxide 22% which is a very high concentration. When you first put it on the Zinc Oxide will leave a heavy white film on your face that has to be rubbed in. Their goal was to create a truly unique SPF moisturizer using a breakthrough transparent zinc. Combining organic and natural ingredients like green tea antioxidants, shea butter, and pomegranate, it all came together in this clear SPF 30 broad spectrum protection daily moisturizer that nourishes the skin and prevents wrinkles, early skin aging, and sun damage. I do think the product is not completely clear but still has a tiny bit of whiteness that has to be rubbed in but barely at all. It is so much better than any other product I have ever used before. One thing that is important that you should know about this product is that it is EWG Top Rated and Award Winning. The Environmental Working Group (EWG) is a group that helps keep bad ingredients out of skincare and personal care products. Kourtney Kardashian even went to Washington to lobby for them. They are proud to say that for three years running (2018, 2017, and 2016) the Environmental Working Group (EWG) has named the block island organics natural face moisturizer a Best Moisturizer with SPF. They aim to create quality safe and effective products. It is an honor to be recognized as a top rated SPF moisturizer/best sunscreen year after year. Also most mineral-only SPF products leave a white cast on the skin without it being able to be rubbed in. Eliminating this was one of their top priorities. After working tirelessly on many, many formulations they can say they've done it. It was a breakthrough and block island organics is happy to bring this clear UV protection product to you. Their aim is to make all of their products with organic and natural ingredients which is why the natural SPF moisturizer is clear zinc only and has no chemical UV filters. This makes it a physical sunblock that is ocean friendly / reef friendly, cruelty free (not tested on animals), and non-toxic. Plus, because our safety and their product quality are of utmost importance to them, it’s also paraben free, gluten free, PABA free, sulfate free, phthalate free, dye free, silicone free, and fragrance free. Finally, they infused it with vitamin rich botanicals like shea butter and aloe to moisturize your skin deeply and leave it glowing. Whether you’re a man or a woman, an infant, child, teen or adult, their SPF facial moisturizer is perfect for even the most sensitive skin.Why? Because zinc, the only sunscreen ingredient in use, is considered the safest and gentlest one around. It also offers the broadest protection so you get great UVB and UVA coverage. Combined this is why this SPF moisturizer is perfect for all ages - from babies to toddlers to kids to adults, and all skin types. Formulated for the face but also great for the body, block island organics natural face moisturizing lotion SPF30 will protect your skin year-round from the daily commute, to running errands, to working out, and everywhere in between. It has been found to be best to apply in multiple small dollops instead of one large glob. This provides an even and smooth application. Just make sure to use enough - about a shot glass full for the entire body and face. All-mineral SPF products like this used to be known as sunblock but these days that’s no longer the case. Instead, everything is considered a sunscreen. 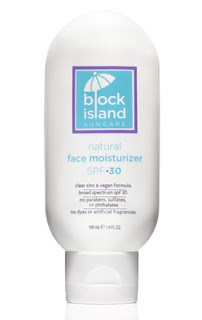 But don’t upset, block island organics SPF moisturizer still only uses physical sunscreen ingredients. No chemical sunscreens here. Why did I feel the need to have this on the winter gift guide? For skiing and other outdoor activities as well as regular daily wear. It is important to wear at least SPF30 everyday to prevent skin aging, skin cancer and skin problems. So this would make a perfect gift. It is one of the best sunscreens around. It works quickly, it is EWG top rated and it is good. Purchase online at www.blockislandorganics.com. Like Block Island Organics on Facebook: https://www.facebook.com/BlockIslandOrganics; Follow Block Island Organics on Twitter:@BIOSuncare; Follow Block Island Organics on Pinterest: https://www.pinterest.com/biosuncare/; Follow Block Island Organics on Instagram: https://instagram.com/blockislandorganics/ and FollowBlock Island Organics on Google+: https://plus.google.com/+Blockislandorganics/posts.